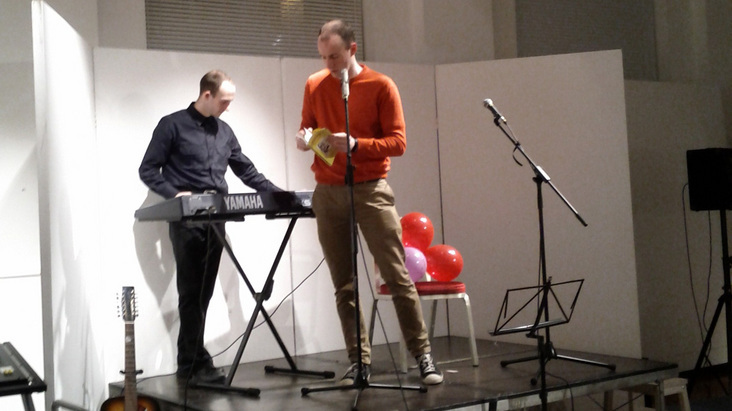 As the first event of the World Community Arts Day programme to open, Craigmillar Writers Group hosted a packed event in SPACE, where local poets entertained a happy throng along with Edinburgh’s Inky Fingers. It proved to be a very lively evening for the near capacity audience of 100, including Kenny MacAskill MSP, Dr Donald Smith of the Scottish Storytelling Centre, who introduced the event, and Eleanor Livingstone, Director of StAnza, Scotland’s one and only poetry festival. The Tyne and Esk Writers Group were also represented. The compère, Harry Giles, was energetic, witty and a great poet in his own right as he began his duties introducing the wide range of poets on display. Jak McKenzie, Nikki Barnes, Susan Heron, David Sisson, Peter Scott, Finbar, Josie Samuels, myself and Wir Makar, Diane Heron, were on fine form for the Craigmillar Writers Group, while Rose Fraser Rachel McCrum, Dickson Telfer and William Treeby, Colin McGuire, Katherine McMahon, Alec Beattie, Tracey Rosenberg, Andrew Ferguson shone for Inky Fingers. Guests the hirsute Milton Balgoni and Jordan Butler had everyone jumping.